Yes or no? Poker player Ashley Adams gives himself the 20-question "Gamblers Anonymous" test. Some of the questions on the "Gamblers Anonymous" test don't seem to apply so well to poker players. 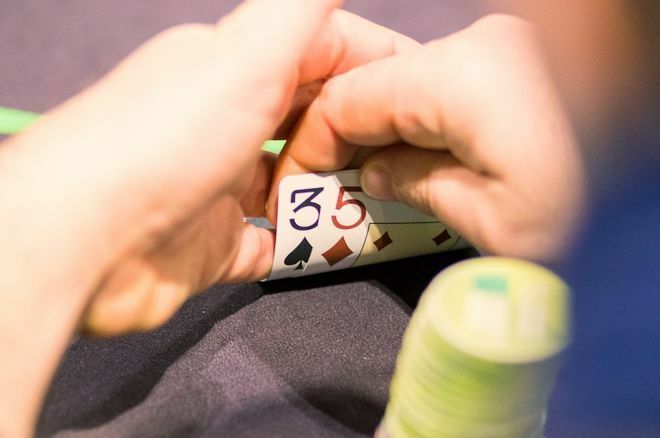 Between the recently completed World Series of Poker and other summer holiday trips to gambling destinations, many of us have been playing a lot of poker lately. Some of us play a lot of poker all the time as we are professionals, semi-professionals, or committed hobbyists. As you've played a lot of poker, if you're like I am, you've thought at least once or twice about the possibility that your enthusiasm for poker might mean that you are a problem gambler. Being a responsible adult, I've sought out the answer to that question in the conventional way, by taking a survey put out by Gamblers Anonymous meant to help people determine whether they might be problem gamblers. I thought I would present that survey to all of you here to answer, if you'd like. I've also provided my own answers, and afterwards added some thoughts about what I would consider some of the inherent problems of applying such a test to poker players. I have scheduled time off from work to play poker, so strictly speaking my answer is yes. That said, I have never failed to come into work because I couldn't drag myself away from a poker game. I don't like losing — at anything — which means my mood after a losing session might not be quite as upbeat as it normally is. Still, I would have to answer no to this question, as playing poker has never been the cause of arguments or stress in my family. And my home life has never been unhappy. Sure it has. My reputation is shaped, positively and negatively, by what I do with my time. Some people may think less of me because I am known to play poker; others might admire me for it. Surely, though, in the spirit of the question, I don't think I have a bad reputation because I am a poker player. So my answer here is no. I might have felt bad about a decision I made. I might have been sorry that I was outdrawn. But no, I've never felt guilty or sheepish about the fact that I've played poker. Strictly speaking, I have used my earnings from poker to buy things for my family. But I've never thrown caution to the wind and plunked down more than I can afford in the hope of covering some debt with future wins at the tables, which is what I think is the intended direction of this question. So my answer is no. When I quit after a losing session I do so with some expectation that I will eventually earn back what I've lost and then some, given that I am generally a winning player. But I don't feel compelled to return to win back what I've lost. I also don't feel any urge to return quickly. So I answer no to this one (though it was a close call). When I quit after a winning session, I look forward to playing again and winning more. But I don't feel compelled to return quickly to do so. Again, it's a somewhat close call, but my answer is no. I guard my bankroll very carefully. I will never do this. No. I have forgotten my poker bankroll a time or two and borrowed money from a friend for a playing session (repaying it immediately), so technically I have done this. But I think the question goes after the deeper debt and borrowing that is involved with people who go bust and then borrow money, something I have never done. I answered no to this question, though if I were being 100 percent literal about the question it would have been a yes. Once again, a strictly literal reading of this question would require an answer of yes, as I once used the sale of some old comic books to fund my first poker bankroll. But since I think they're really looking at someone who is broke and desperate, selling or pawning some object of value just so he could get back into action, and since I've never done that, I answered no. I have always kept my poker bankroll separate from my normal bankroll, only using my poker funds sparingly to purchase items in my regular life. So I answered yes. No, never. Not even a little. I have surely stayed in a game longer than I initially thought I was going to stay, because the game was really good and my skills had not diminished. Yes. I enjoy playing poker as a holiday from my job and my day-to-day life, much as I enjoy getting away from it all when I go fishing or when I go for a long walk. So I have to answer in the affirmative — yes. I have difficulty sleeping, but playing poker doesn't have anything to do with it. I have never been so upset over a losing session that I couldn't sleep. But I have stayed up late in many a poker game, depriving myself of sleep I might otherwise have gotten, so I answered yes to this question. I enjoy poker regardless of arguments, disappointments, or frustrations. They don't create any urge for me to play more — no. The answer to this question is the same as the answer to the previous one — no. I've been upset by a particularly bad loss from time to time. But no, it's never made me feel even slightly self-destructive or suicidal. Gamblers Anonymous says that if you answered "yes" to seven of these 20 questions you have a gambling problem. I answered "yes" to five, but I could have easily answered "yes" to six additional questions. That would have brought my total up to 11, making me unquestionably a problem gambler. Truly, though, I think the questions need to be adjusted for poker players, at least for those of us who are professionals or semi-professionals. It seems to me that the real test of whether you're a problem gambler is whether the gambling has a serious and negative impact on your life, and that you can't or won't stop. If you started your poker career by selling your motorcycle, or if you stay late in a great game to maximize your wins, or if you are eager to return to a poker game to make more money, or if poker provides a refuge or respite from your day-to-day life or job, or if you shelter your poker bankroll from your day-to-day expenditures, or if you borrow money to play sometimes, or if some moralistic idiots judge you harshly because you play poker, none of those things mean that you're a problem gambler in my book. But then, maybe I'm just a problem gambler in denial!